MARSHALL, MI – Baby formula: Not typically an ingredient at the top of a brewmaster's list. It's exactly what Head Brewer and Owner of Dark Horse Brewing, Aaron Morse did for his most recent experimental beer, the "uber-boober." "We were sitting around and thinking what we could do for extreme session beers, and we got this idea to make a cream ale using baby formula instead of lactose," said Morse. "That's extreme!" he added. The beer was created for the sold-out Extreme Beer Fest, which is being held in Boston March 11th and 12th. The festival will feature a host of "extreme session beers" from multiple breweries across the country. "It will debut there (Extreme Beer Fest)," said Morse. "Once it has been sampled there, we will put it on draft here at the brewery." Only 6 barrels of the beer has actually been made. The base of the beer consists of a second-run from their barleywine, which will typically check in at 15% ABV. The uber-boober, made with 10lbs "non-spit-up" baby formula will only be 4.7% ABV and according to Morse it is quite sessionable. "The baby formula doesn't impart much taste, but instead adds a creamy body to the beer," he said. 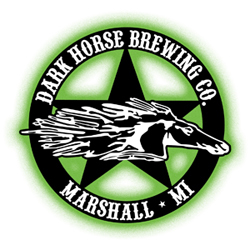 In addition to this experimental brew, Dark Horse is in the process of expanding. They recently acquired the 18,00 sq foot property adjacent to the brew house and will be moving new packaging lines and a 20 barrel system sometime in March. The expansion will allow them to product up to 25,000 barrels. In 2010, Dark Horse produced roughly 6,100 barrels and Morse said he is hoping for 10,000 this year. "If we do more than that I will be extremely happy," he said.